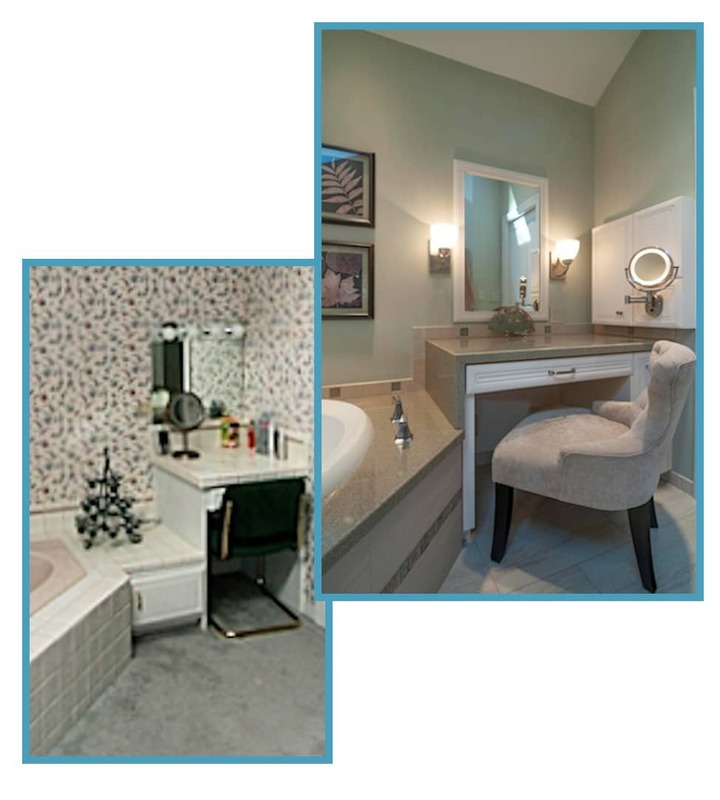 The 1980s master bathroom bathroom looked like the home had been inherited from an elderly aunt, not built for the professional couple only 20 years ago. They were tired of the wallpaper, the mauve color scheme, the carpeting, and tile countertops. 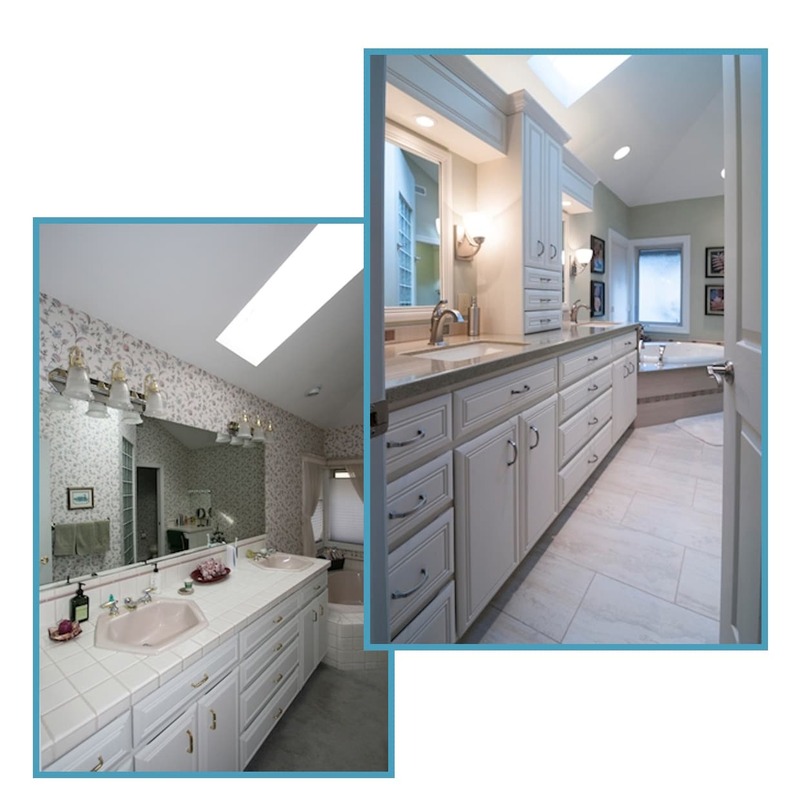 They wanted to update the bathroom while keeping the traditional appearance and feeling. 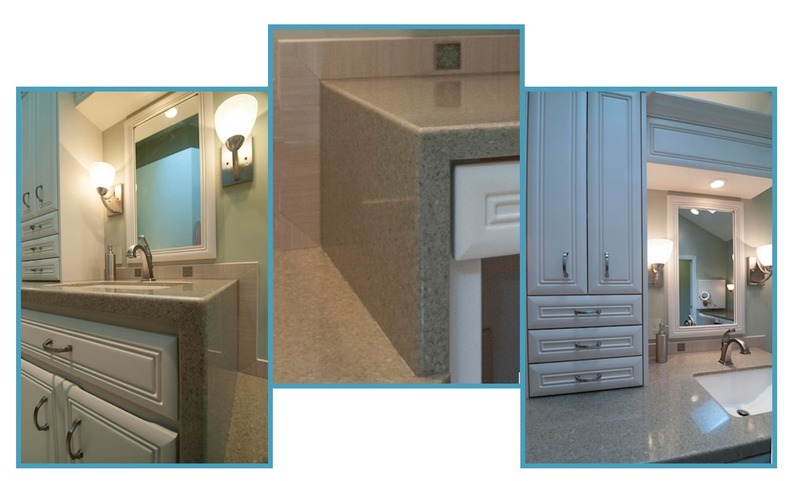 The vanity was redesigned for better storage, enhanced by custom mirror frames and a custom medicine cabinet. The original carpet was replaced by porcelain tile flooring with radiant heating. What makes this bathroom special is the custom tile installation that includes glass tiles inset at regular intervals in the backsplash that flows from the lavatory countertop down to the tub deck and up to the vanity. The same glass tiles were used to frame the custom shampoo niche. A “waterfall” edge was incorporated into the engineered countertops and tub deck. Vanity before (left) with wide mirror; vanity after with tower, bridge lighting, sidelights, new countertops and custom tile splash. Shower before (left), and after (right):New large tile and custom inserts, dual shower heads, shampoo niche and engineered-stone seat. Makeup vanity before (left) and after: larger, with pull-out pantry, medicine cabinet, and lit makeup mirror. Details: “waterfall” countertops to tub deck with custom tile splash; tower between lavatories and lavatory mirror reflecting doorway to shower and makeup vanity. The bathroom looked like the home had been inherited from an elderly aunt, not built for the professional couple only 20 years ago. They were tired of the wallpaper and the color scheme and wanted to update the bathroom while keeping the traditional appearance and feeling. The Homeowners are happy with everything, and their serene traditional bathroom will be a source of pride and joy for years. There’s a link to the kitchen project below.